With the incredible health benefits of amaranth, this grain has been making its way into natural food stores and health conscious restaurants for over twenty years; ever since the National Academy of Sciences recommended it as part of a healthy, diverse diet. Versatile, easy to grow, and incredibly nutritious, amaranth seed is likely to become one of the food staples of the future. Despite its increasing popularity today, the history of amaranth goes back well into ancient times. Amaranth seeds were eaten by hunter-gatherers in Mesoamerica at least eight thousand years ago. It wasn't until around 3000 B.C. that the plant became a domesticated crop, along with maize, beans, and squash. The Incas in South America also cultivated amaranth, independently of the Maya and Aztecs, although it never became as central to their culture as with the Mesoamerican Indians. For the Aztecs, amaranth was known as a super food. They believed it had magical properties, giving it to hunters and runners for sustained energy. Amaranth was also a part of Aztec rituals, which is what led to the super grain's demise over the past several centuries. Crushed amaranth seeds were mixed with honey and human blood. The paste would then be shaped into Indian idols and used during ceremonies. The Spanish conquistadors viewed this practice as abhorrent, and banned the growth and possession of amaranth seed. This grain has an interesting history, but what is amaranth? It is one of over fifty new world species in the genus Amaranthus, along with pigweed, tumbleweed, and wild beet. Different species of amaranth are grown for different purposes – some for ornamental purposes, some for the leaves, and others for the seeds. Amaranth is a tiny, pale golden pseudo-grain, that is not truly a grain at all, but a seed. Amaranth seeds are slightly larger than a poppy seed, and can be cooked like rice, or popped like popcorn. They have a nutty, slightly sweet taste, and a sticky texture. Amaranth is a heat and drought resistant crop, with each plant yielding from 40,000 to 60,000 seeds. It is known as a super grain because of the unique health benefits of amaranth. Amaranth, unlike other grains, is a good source of protein, containing anywhere from 15-17% protein by weight. It is rich in the amino acids lysine, methionine, and cycteine, with a higher content of lysine than any other grain. It is also high in fiber, with three times the fiber of wheat. 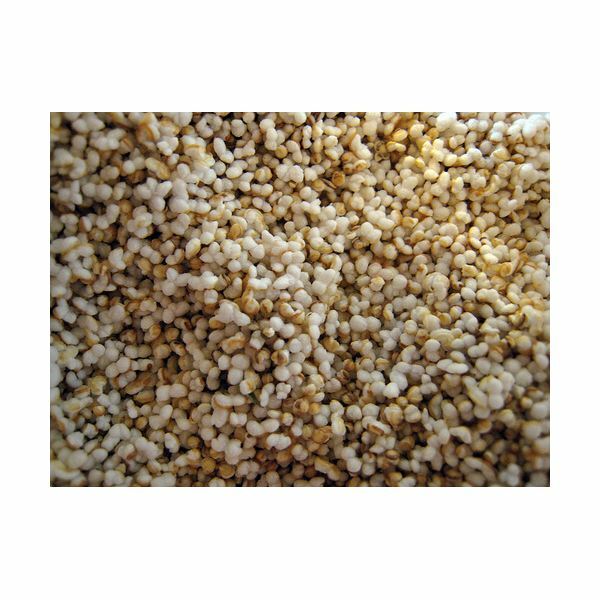 In terms of nutrition, amaranth is loaded with vitamins and minerals. It has more than 20% of the recommended daily amount of calcium, iron, magnesium, and folate. Amaranth is also a good source of potassium, phosphorus, and vitamins A, C, and E. It is a cholesterol-lowering food, with both tocotrienols and phytosterols, two natural compounds known to help the body eliminate bad cholesterol. With such a potent nutritional content, amaranth is an ideal addition to any health-conscious diet. Amaranth can be easily integrated into what we eat every day. The popped seeds can be tossed on salads. Amaranth can be cooked like rice, simply use a 1:3 ration of the grain to water, and then used to stuff peppers or eggplant, added to soups, or eaten for breakfast with fresh fruit and honey. Amaranth flour can also be used in place of regular flour for baking; substitute one quarter cup of amaranth for every cup of wheat flour. Today amaranth is enjoyed around the world. In Mexico the popped seeds are made into a sugary treat called alegria. In India, a similar confection is made, called laddoos. In Peru, amaranth seed is fermented and made into a beer, known as chicha, and in Nepal, it is made into a gruel, sattoo. In America and Europe amaranth is still a new grain. Once people become aware of what amaranth is, and learn its history, it is sure to take its rightful place as one of the world's super grains.